Flat-Earthers say that the sun is not 93 million miles away, but a mere few thousand. There are variations, of course, but most give the figure 3000 miles for the altitude of the sun above the Earth "plane." There have been several ways of calculating this, though most who give the figure just don't know where it comes from. Now, a few people who saw this mentioned that the problem with the graphic was the assumption of a flat Earth. But I didn't have a problem with that; it's what I expect a flat-Earth proponent to do. But I saw two other, quite different, problems with this graphic. The first problem is that it's a lie. Portland, Oregon, is not 3,000 miles from New York, it's closer to 2,500 miles. And the sun is never, ever directly overhead in Portland. I know, I've been there. It's too far north for the sun to ever be 90 degrees above the horizon. So, this entire graphic is made of whole cloth. The second, and much bigger problem, is the assumption that, since you can take these two points on the Earth, triangulate the position of the sun, and arrive at a distance that is much closer than the accepted figure, that you've proved your case and your work is done. Let's see how this works out. Okay, we're going to assume a flat Earth in the following calculations. And we're going to simplify the scenario, while using actual data instead of made-up data. The simplification consists of two parts, neither of which is fudging: first is to choose locations along the Tropic of Cancer on June 21st, so that the sun can actually be overhead, and the second is to pick locations where the solar noon and noon on the clock line up, so that we're comparing apples to apples from different time zones. All of the coordinates I'm giving are at 23.43 degrees north, so I'll only give longitudes. My anchor point is near Indore, India, at longitude 75.5 E, which is at UTC+5. It will be noon there, and the sun is, indeed, directly overhead, 90 degrees above the horizon. That's my version of Portland, with the benefit of having real data instead of assumptions. My version of New York will be in Taiwan, at 120.5 E, UTC+8, where it's 3:00 p.m., same as in the graphic. But at 3:00, the sun isn't quite at 45 degrees; that was another assumption, a convenient halfway point. The real angle is 48.86 degrees. The distance from Taiwan to Indore is 2,841 miles, making the height of the sun, if the Earth is flat, 3,252 miles. Sounds good. That's really close to the figure given by flat-Earthers. So, without the assumption that the Earth is a globe, we have an alternate figure that's just as valid. Right? Not so fast. Two data points don't constitute proof. Let's up the ante a little. We'll start small, and move over just one time zone, a little north of Vietnam, 105.5 E, UTC+7 at 2:00 p.m. at a distance of 1897 miles from Indore. Now the angle of the sun above the horizon is 62,5 degrees. With these new figures, the calculated height of the sun is now 3,644 miles. That's quite a discrepancy. What if we move further away? When it's noon in Indore, it's 7:00 a.m. at the Prime Meridian, which at this latitude is in Algeria. So, we're at 0 degrees longitude, UTC+0, and Indore is now 4,724 miles away. The sun is to the east now, at an elevation of 21.71 degrees above the horizon. 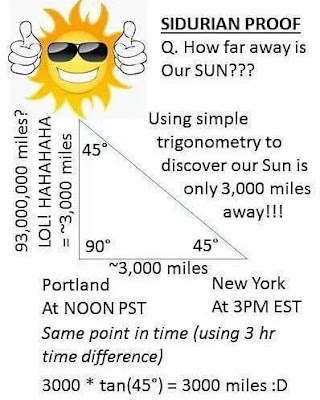 If we triangulate on that, the altitude of the sun now calculates out at 1881 miles. What happened? I think you know the answer. These elevations all make sense on a globe. Measuring the actual distance to the sun is not easy. It took literally a couple of thousand years for astronomers to get close, thanks mostly to insights by Edmund Halley, who didn't live to see his work put to use. To think that these oversimplifications and cute and completely misleading graphics can usurp the work of brilliant minds over millennia is the pinnacle of hubris, and unfortunately a common thread in the arguments of proponents of the flat-Earth. ADDENDUM: A Twitter user took me for task for calling the data I used real, stating that I was just assuming that the data were correct. His argument was that, as I didn't collect or verify the data myself, I was wrong to trust them or use the word "real." This is a common misunderstanding used (and abused) by pseudoscientists who, out of ignorance or malice, misuse the words verifiable and falsifiable. The data I used are both verifiable and falsifiable. They are straightforward numbers which could, at any time, be challenged by independent observers all over the globe, who would either confirm them or discover them to be wrong. It is not necessary for every single user who employs the data to verify all of it; what would be the point of collecting, publishing, and calculating data if everybody had to do it all over again? No progress would ever be made with that kind of burden. And so I stand behind my use of online data, in this case from NOAA, to demonstrate the fallacy of measuring the distance to the sun assuming a flat Earth. I suggest that any flat-Earther who wants to challenge my conclusions stick to facts and avoid attacking tried-and-true methods and data sources. 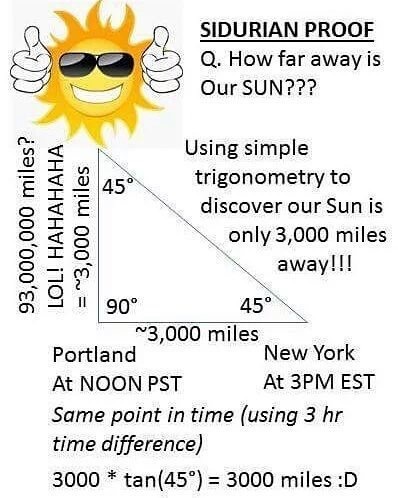 Have you an idea why the sun appears north of Portland despite the tropic of Cancer positioned south of Florida? It is, honestly, hard to put into words. But if you think about it spatially, remembering that the sun is not "above" any point, but that points on the Earth are aimed at the sun at various times, and keeping in mind that the Earth is tilted toward the sun in the Northern Hemisphere's summer, you can see why sunrise and sunset are, in the summer, slightly to the north even north of the tropic. If it helps you think about it, consider the 24-hour sun in the Arctic circle; at some point in the course of the day, the summer sun must appear north of any location on Earth except the physical pole. In Norilsk, Russia, for example, the sun is up all day during the entire month of June (and then some). The sun circles the sky. How can it not appear to be north of Norilsk for part of the day? Actual consideration of what it's like to live on a globe goes a lot further than just posing questions that seem unanswerable, hoping to "catch" someone and score some kind of point. If you're serious in your inquiry, get a globe and a light and a basic book in astronomy and work out the reality of it. Which is that the Earth is not, and cannot be, flat. Ecne Lutalf, I already explained this. If you can't learn what verifiable and falsifiable are, you have no place commenting on the reliability of data. And nice fallacies, by the way: guilt by association, assertion without evidence...a lot of sloppy thinking in one little comment. Why don't you describe, right here on this comment section, in detail how you would use a sextant to determine the distance to the sun. Make sure that you give details so that anyone, anywhere in the world can reproduce your methods. I look forward to your reply, though I do not expect it. Aristotle, by the way, was a geocentrist, not a flat-Earther. Just saying. positioned. The same procedure will be repeated from the second position and third position. The chart location of the object to be positioned is at the intersection of the resulting three LOPs. part of a NOAA 77-5 chart updating report. object/structure is measured and its height determined. Fine. Now apply this to the height of the sun from three or four locations on Earth. On a flat Earth they should all be consistent. Let me know your results.